Hi all, I have been very remiss in attending to the blog, got tangled up in several real life thingees. Anyway the group played on from the last post for a little in Silver Age Sentinels ruleset. 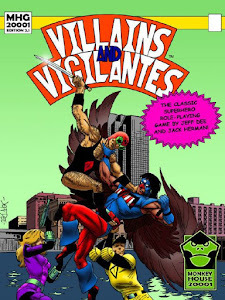 When the Mighty Protectors was finally released ( Villians and Vigilants 3rd ed) the group decided they would like to change to this rule set. Once that was decided one of those life thingees meant we couldn't start until late October/ early November. So there have been a few sessions prior to the next recorded session. In it the group were reintroduced into Silver City - Omen was the only one that stayed the same between groups, The Enforcer was replaced by the Man of Action, Rick Dangerous by Indigo, The Velvet Hood by Junk Knight and White Owl by Nightstar. Thus far the group have encountered a dock side robber of artifacts destined for a museum, these men connected to something called Hive and some as yet identified leader, a female , possibly in the employ of the HIVE - Somnambulist - who sent the group into a dream while , assumed - HIVE stole the items from the museum. Prior to all this the group had an off camera throw down with some group that were hunting MOA and outside of town. This event led to the groups' formation, their acceptance and deputisation by the Mayor and a liaison officer with the Police force of Silver City to operate. They even were gifted an old Veterans hall to operate out of , staffed by several return service men. That about brings you up to date. Last late change - one of the players (Indigo) needed to drop out of the game for a while so the group is reduced to four for the foreseeable future.